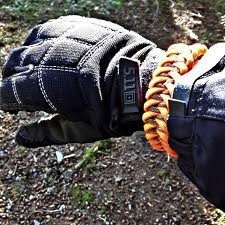 Paracord survival bracelet. Buckle includes integrated whistle & fire rod and steel. Commercial grade 550 parachute cord has a tensile strength of 550 lbs. It is made up of a core of seven inner strands, tensile strength of 50lbs each, surrounded by an outer sheath, tensile strength of 200lbs. Unravelled, when in a survival situation, will provide feet of strands/cord which can be used for fishing, tying, hiking, hunting, survival or any outdoor adventure! Available in multiple wraps, colours, and sizes. Sized according to length in inches.